I know, I know, what happened to resolution number three? Getting my post done early? It’s only December 29th. (That’s my excuse and I’m sticking to it.) Back to my mad scientific experiments once again. I was at Michael’s Crafts yesterday and saw unfinished wooden frames for a dollar. 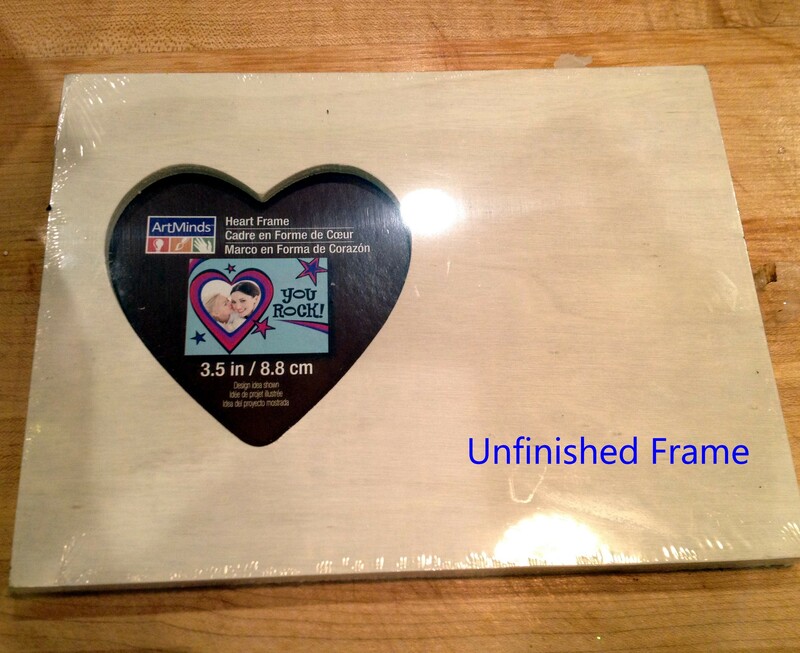 Intended for Valentine craft projects they have a cut out of a heart. Not that I in any way needed another project or more supplies, but I was curious about what I could do with them. I figured at the very least I would do something with them and put them up for sale on etsy. Time to play in the studio. 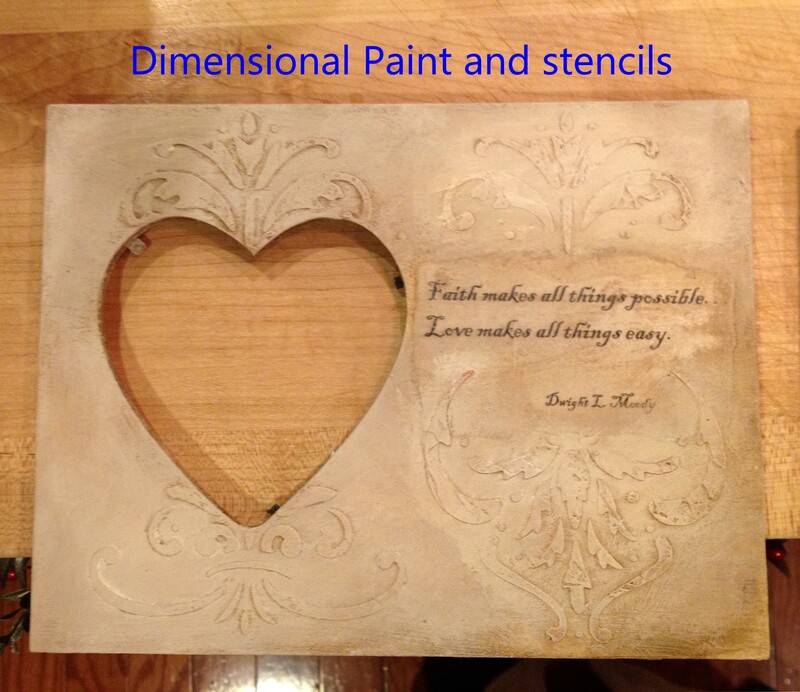 I painted the first one white and then added some dimensional paint on top of some stencils, when the dimensional paint dried I painted that white as well. 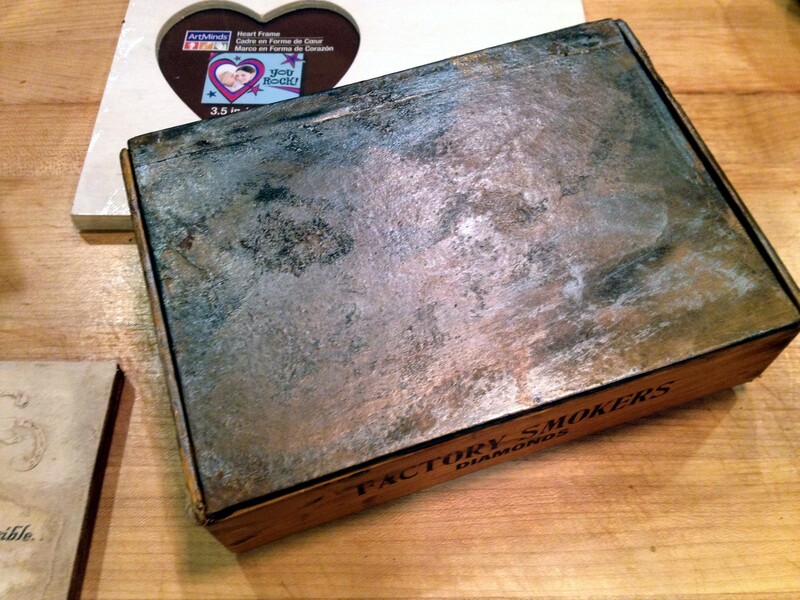 Then added a little antiquing mixture for patina, and finally a quote about love. Nice enough, but not where I was hoping to go. I decided to try the burnt glue technique. I figured if it works on paper, why not unfinished wood? It works beautifully. However, unlike the paper/glue burning technique, the unfinished wood needs to sit for a half hour or so to cure. When it was completely dry I dry rubbed in some antique bronze and pewter acrylic paint. Amazing! 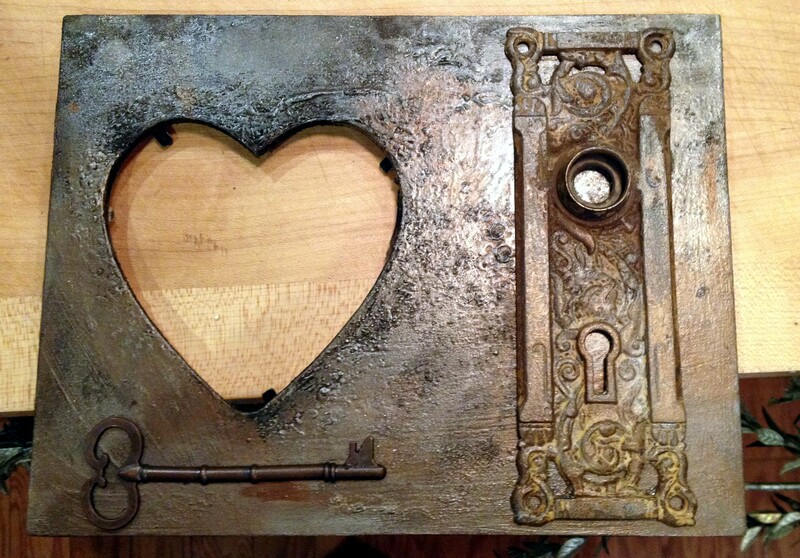 I made the addition of a vintage key and vintage door plate and I love it! You know it couldn’t end there. I started thinking about other things that might be possible candidates for this technique. 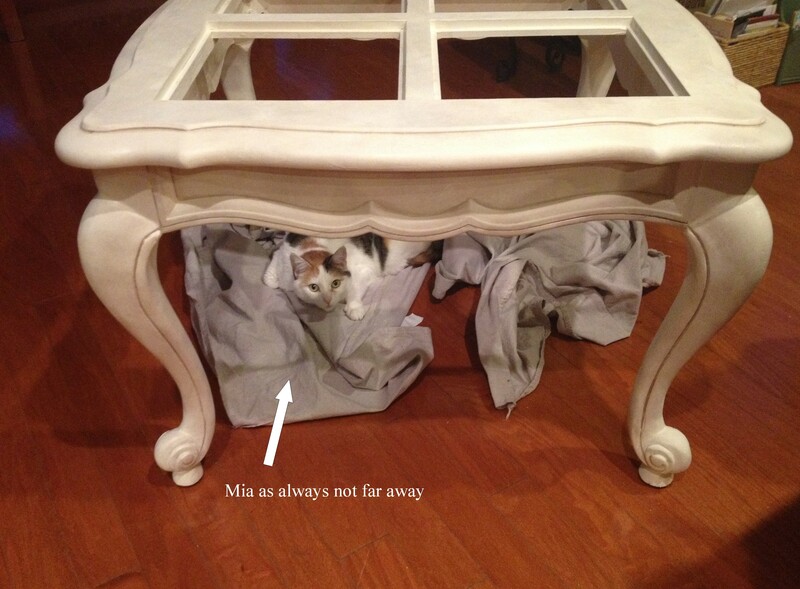 The cat? 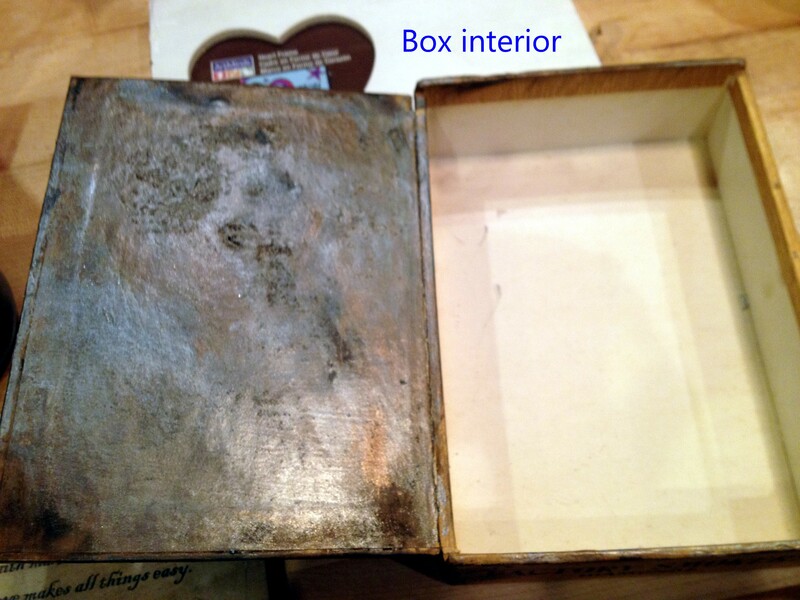 Too much cat hair, although I did see that crafting with cat hair book at the store… Searched the studio and found an empty cigar box. So cool. I’m obviously a little obsessed. 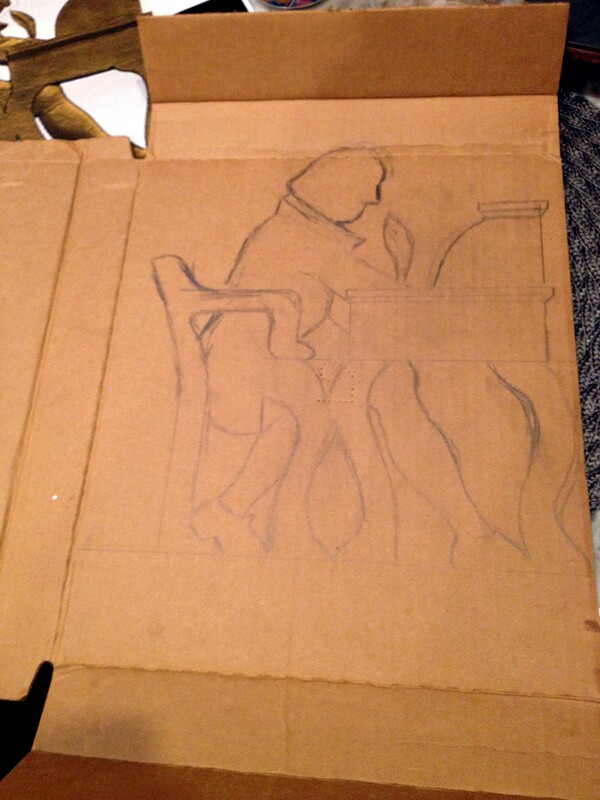 I won’t have time to finish the cigar box tonight, but it is well on its way. I have a few ideas for additions to the top, but those will have to wait until tomorrow, meanwhile I’ll be thinking about what I can cover next. A wooden chair?????????? It may be time for an intervention. The not quite where I want it so it’s not quite finished piece. Did you ever start a project that seems so simple and straightforward, but then it turns into a never-ending nightmare where things keep going wrong? 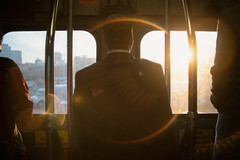 It happens quite a bit when you fly by the seat of your pants, and when your brain is a little muddied with stress. Feeling no control in you life when you are a very controlling person can really throw you off your game. I’m also one of those people who never measure. I eyeball everything I do. It drives Dan crazy. He measures and then measures again, and then he will recheck his rechecked measurement. I just do it and if it doesn’t work out I do it again. This of course leads to multitudes of nail holes, lots of wood putty or spackle, and lots of sanding. Twice as much work just so I don’t have to use a ruler. (I swear it’s because of math. 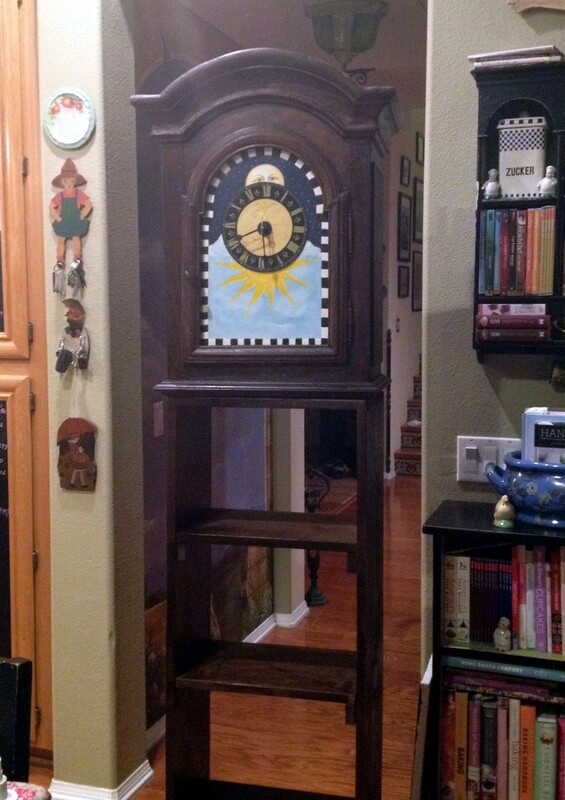 It ruins my life) I spent the day working on my grandfather clock/bookcase. It’s coming along, but as always it’s not quite right, but I like things a little off kilter, just like me. Not ready to reveal the clock project yet, my entire day seemed to be a series of mishaps, but I did do a watercolor for this evening. I will say this, when I paint the stress melts away. Just another of the many reasons I should do it more often. A very short post tonight from a very tired woman. As I mentioned last night, I’m a worrier. For last night that meant not being able to sleep until after two thirty this morning, and when sleep finally did come it was short-lived. My neighbor decided to turn on his garden lights at five thirty. I was done sleeping after that, needless to say I am exhausted. I will post and head to bed. I get a great deal of satisfaction when something that I have a vision for in my head becomes a reality. A few posts ago I wrote about a little antique cabinet that Dan gave me as a Christmas present. 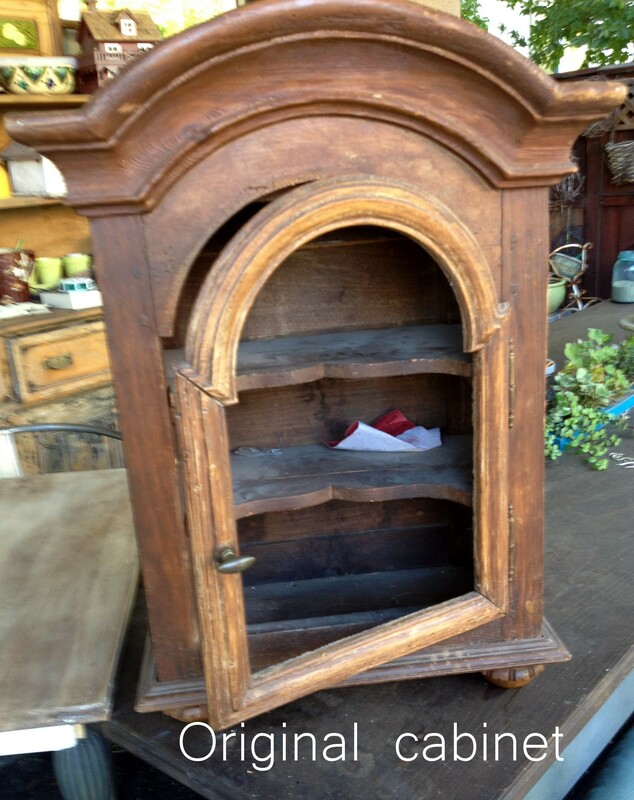 As I said then, from the moment I saw this cabinet I thought grandfather clock. 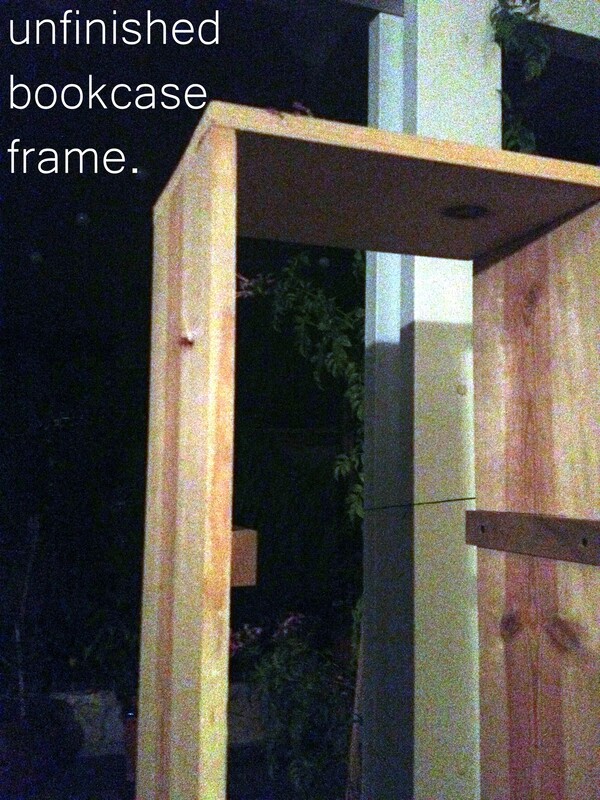 Dan built a bookcase for me last week. 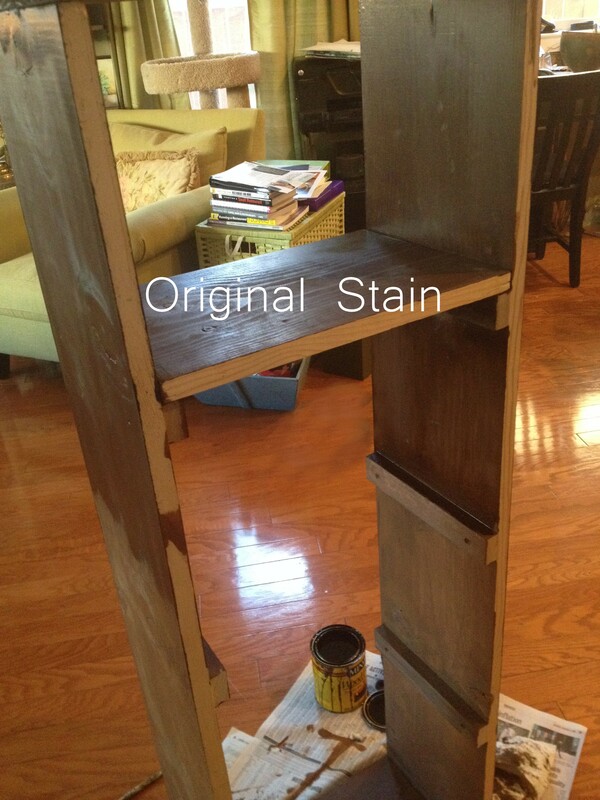 I tried to match the stain for the bookcase to the stain on the old cabinet, but it just didn’t work. I gave some thought to painting the entire piece, but I really didn’t want to paint the cabinet. It is a beautiful piece, and I really couldn’t bring myself to do it. I left the project unfinished until today. I looked in our garage to see what we had on hand. I came across a can of a lighter brown paint. I had an idea that I wasn’t sure of but decided to give it a try. The problem with the unfinished wooden bookcase that Dan built was that the wood was different from that of the cabinet. 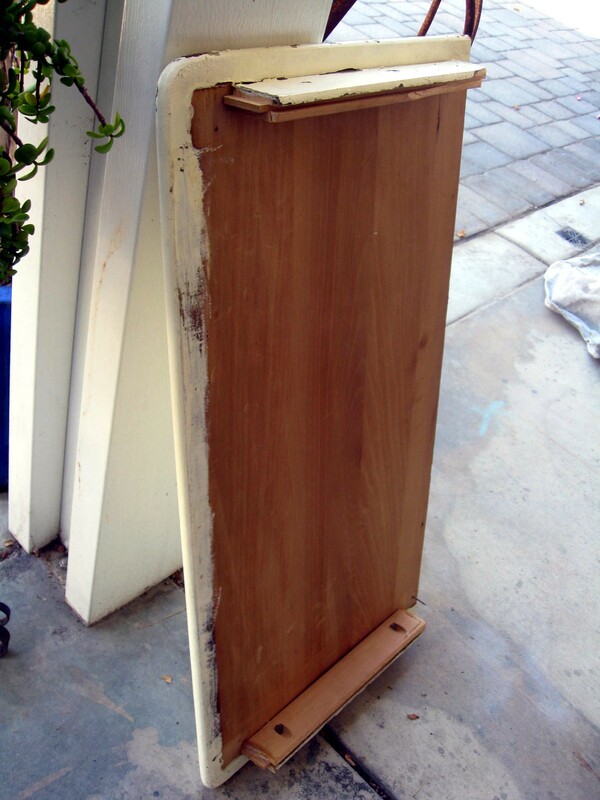 By adding a light coat of paint to the cabinet, it allowed the wood to be sealed but still show the wood grain. 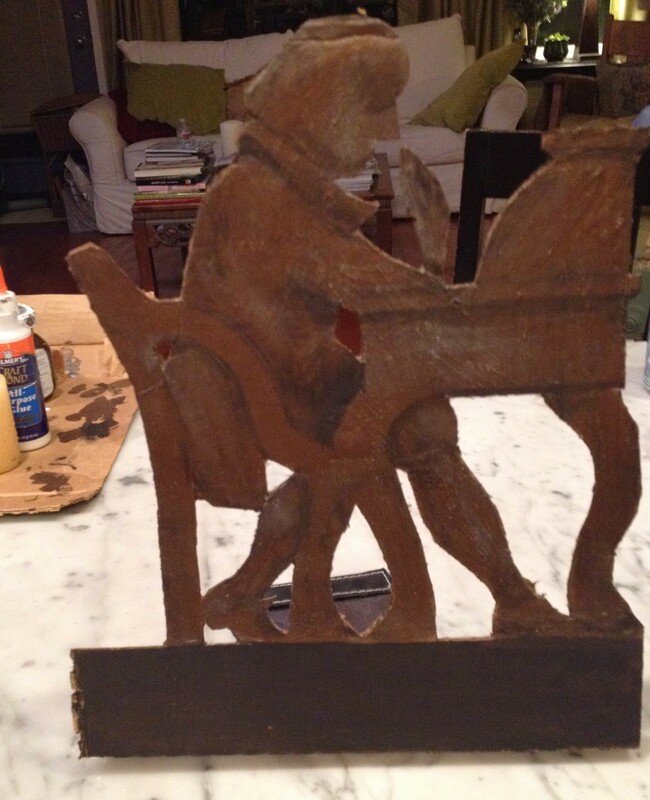 I let the paint dry and then went over the entire piece with a dark wood stain. Amazing results. The wood of the bookcase is incredibly close to the wood finish of the cabinet. I still have some work to do on the piece. I need to add a back panel, and something really special, the words of the nursery rhyme, Hickory Dickory, Dock. Of course that means I needed a mouse to run down my clock. 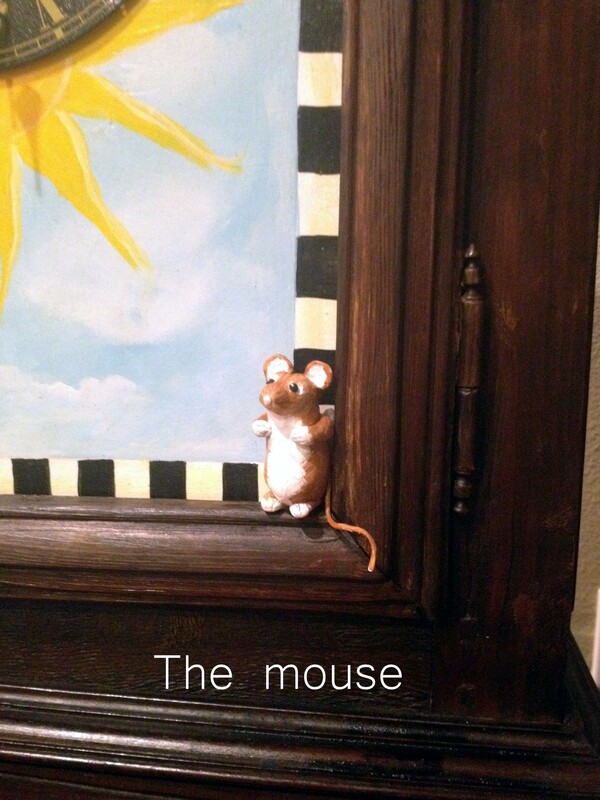 I used Sculpy to make a mouse, painting him when he was finished baking. I also want to add some trim, a bottom panel, and finally some feet. Hopefully I can get to that in the next few days.The finished piece will be for the children’s section of our store. I want the shop to be as inviting as possible. A few photos, before and after, and of course my mouse. That’s all for tonight. I need sleep! Goodnight. I’m not really distressed, but my project will be by tomorrow night. The marriage of my two pieces finally took place today, but we aren’t quite at the honeymoon stage yet. The crib panel is too large in proportion to the height if the seat. I have a number of solutions in mind, one of which I may attempt tomorrow. For now the piece is painted, but even that isn’t where it will end up. You may have noticed in the before photo that the color is similar to the color I started with, that is purely coincidental. I am trying to work with what I have on hand. That color was in the garage. The finish will look different tomorrow when I have my way with it. I don’t like new and shiny, never have. I love vintage and time-worn. 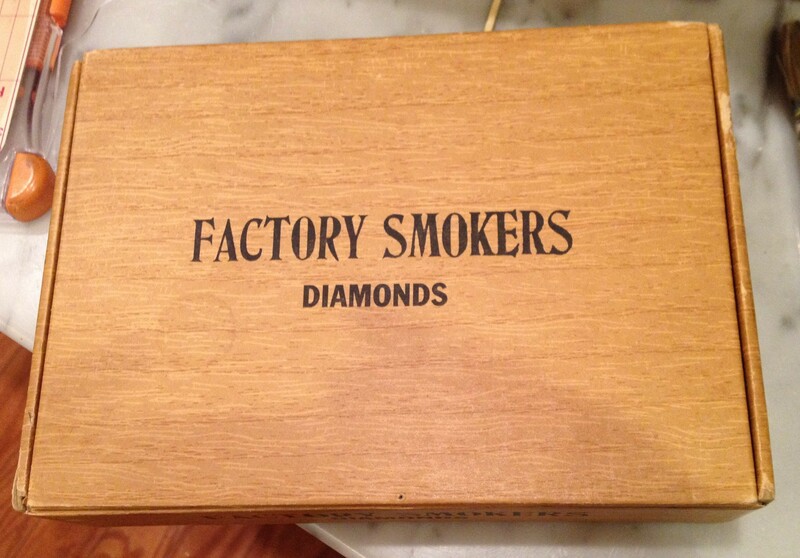 There is very little in my house that is new, most of what I own is vintage. In my armchair psychologist best I believe it has to do with my longing for family connection. Growing up many of the kids I knew had grandparents, I didn’t. My grandfathers had both passed away when I was very young, and both were living in Ireland, as were my grandmothers. I met my Mother’s mom several times, and we stayed at her house in Ireland for a few weeks when I was thirteen, but we were never with her enough to really get to know her. I knew my other grandmother slightly better. She had tried to live here in the States but only lasted a few months. I was only five or so at the time, the thing I remember most was that she sat in my rocking chair all the time and I wasn’t happy about that. When I grew older I wrote to her, and on my last visit to Ireland in 1983, I spent some time with her at the home she was living at. She died a year later. I think I’ve spent my life searching for that connection to the past. I know there are people who hate antiques. For me I appreciate that the piece has a history, a story, that it was loved enough by someone to still be around. When I finished painting my bench it just looked too new. So, after all my hard work of stripping and sanding, and adding a fresh coat of paint, I grabbed the sandpaper once again and went to work distressing. Tomorrow I will be taking it a step further by adding an antiquing glaze. I love that aged distressed look, kind of like me. A little extra project tonight. I was having fun doodling with my fine line markers. Tomorrow another marriage of sorts. I’m one of those people who almost always follows the rules. I often joke that I was born responsible. Throughout my life I have always tried to do things the right way. It doesn’t mean that I haven’t had some major league failures, but I try hard, always give my best effort, and crucify myself with guilt if I fail. (Catholic, remember) I never had a teenage rebellion, always did what my Mother asked, at the moment she asked, and could probably be labeled a “goody two shoes”. (An odd expression, who comes up with this stuff?) I think my only rebellious streak applies to the a fore mentioned failure to read the rules. I’m a very smart woman, really smart, apparently so smart that I think I can do everything without reading the instructions. I mean, who are “they” to tell me how to do something? I bring the “not following the rules” issue up because I had a moment today when I thought about my biggest faults as an artist. 1. Failure to read instructions, or to take classes. In my defense, I have been doing things my own way for so long that quite frankly other people annoy me when they tell me what or how I should do something. 2. That dirty word, Perspective. Hate it, wish I didn’t have to care about it, and generally it gives me nightmares. It is equal to the horror that is geometry. 3. Impatience. I’ve touched a little on this in the past in regards to oil painting, but it really applies today. As I write this I am waiting for paint stripper to take effect. Herein lies the problem. I don’t want to wait. I want the paint to fall off right now. I’ve mentioned before that I have artistic vision. 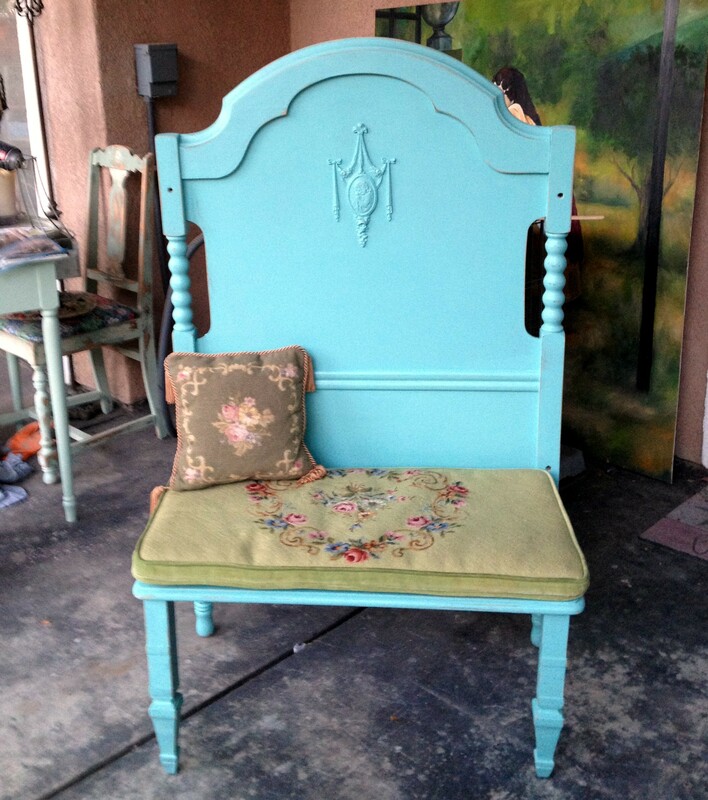 In particular when it comes to painting, recycling, upcycling, reupholstering, and re-imagining furniture pieces. In my head the piece is done. 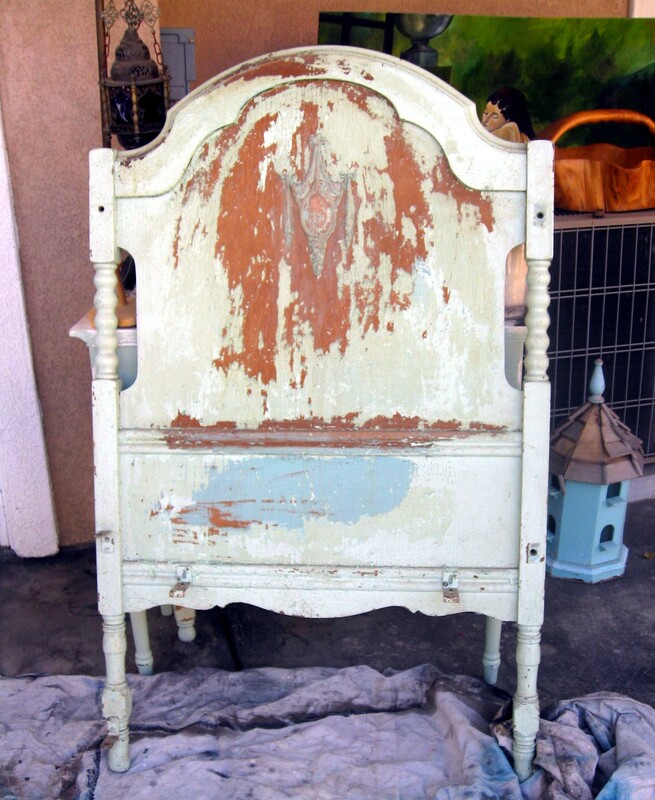 It is painted, stained, distressed….and so on, in my head. Therefore I want it done now. Not in thirty minutes, or even fifteen. I want what is in my head standing in front of me. 4. Procrastination. 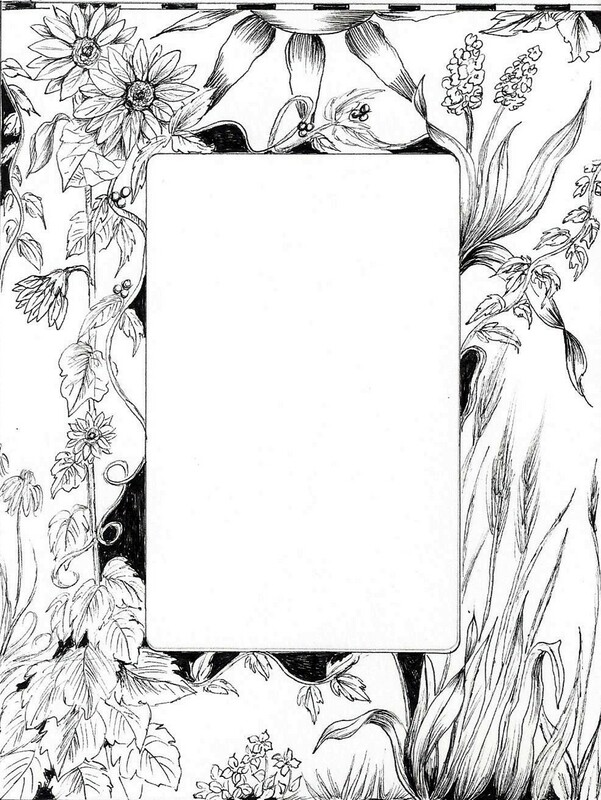 Once again, putting myself and this daily project on the back burner. Poor Dan has spent more than one night falling asleep on the couch waiting for me as I type my blog late at night. Starting paintings after dinner is not the way to go, it’s just that I am ingrained with the notion that everyone else comes first. It’s only four in the afternoon here in Temecula, a fact I proudly brought to Dan’s attention. The truth is I’m only writing because I have to wait for more stripper to work! Sixteen more minutes until I can scrape again, its killing me. Maybe I need to work on consecutive projects, that way I’ll fill every minute. I took my own advice, and thrilled that I did. Stripping my wood piece is taking much longer than I planned for. As I was looking for pieces to add to my project I came across a small piece of vintage decorative wood I bought years ago. I have been meaning to do something with this piece for the longest time. From the moment I saw this piece of wood it reminded me of church windows. I have several gravestone photos from Richmond, Virginia, one of which I used in a previous altered art project. I changed all the photos to black and white, then I cropped and printed my photos on vellum. 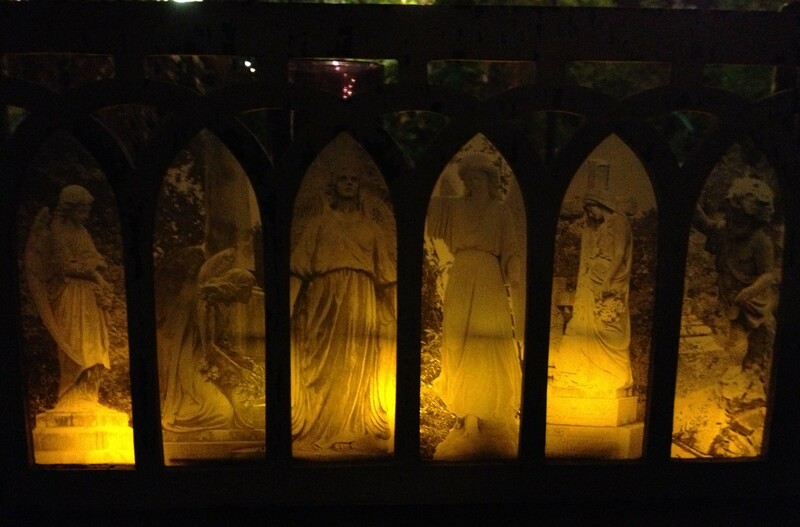 Attached inside the frame and lit from behind using battery operated candles, it’s beautiful! 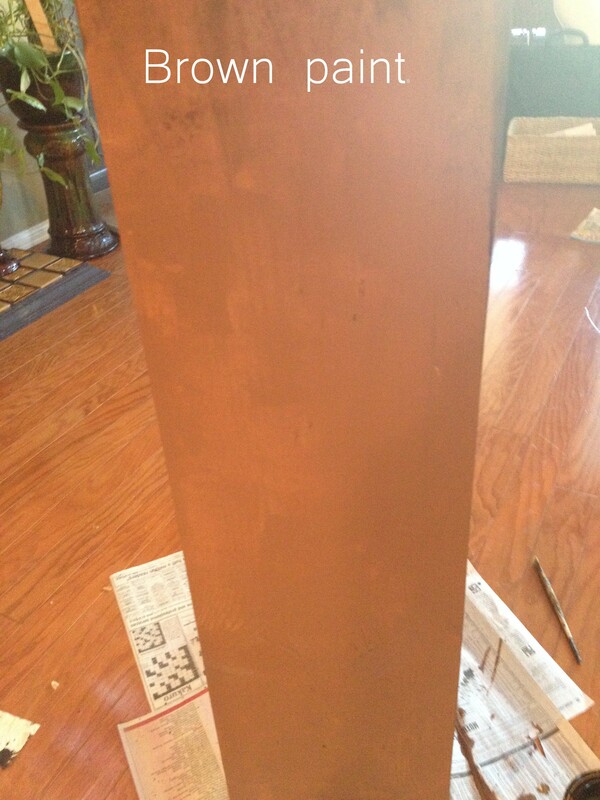 I have some finishes to add in the morning, as well as continuing with my furniture piece. It is now ten at night. I know, I started this blog hours ago, but in the interim I had a very romantic evening with Dan in the garden. First a wonderful dinner, and then a movie. A few years back we built our own outdoor screen. Tonight we watched Midnight In Paris under a full moon. Sometimes the blog can wait. Photos of the beginnings of a project. 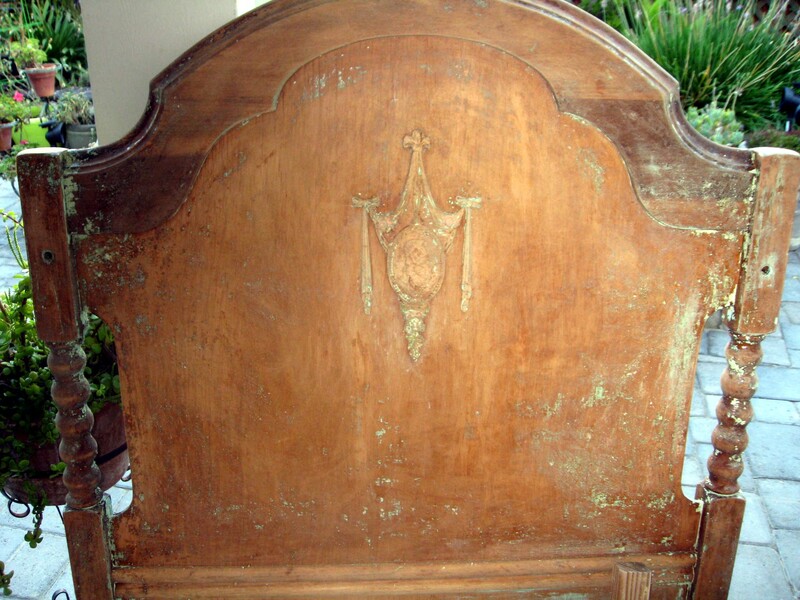 Roughly fifteen years ago I purchased an antique headboard from a crib with the intention of doing something fabulous. It never happened. It was the height of my ignoring myself. Today I decided to do something with it. The second piece happens to be the top off of a small dresser from my Mom. The dresser fell apart, but since my Mother gave it to me I needed to keep some part of it, and it happens to be a perfectly good piece of wood. The two shall marry tomorrow, all are invited to the reception. The crib still needs a little work. (So I guess that makes it the groom…just kidding) Also the photo from the second project from today. My candle lit gravestone piece. Much to do tomorrow….stay tuned. 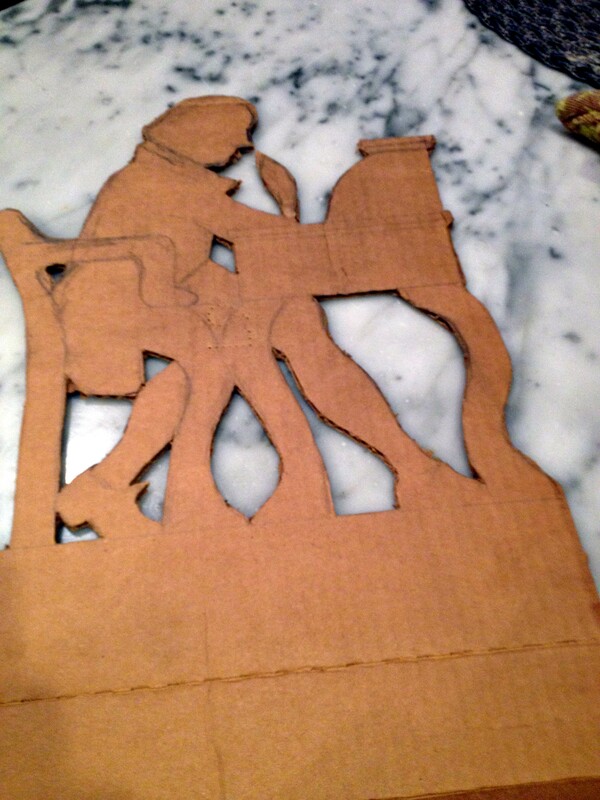 Gravestone piece in progress, back-lit with candles. Not a lot of time for art today. Driving to see family through the desert, and then dinner out. We did stop along the way for a break and lunch at a rest stop. 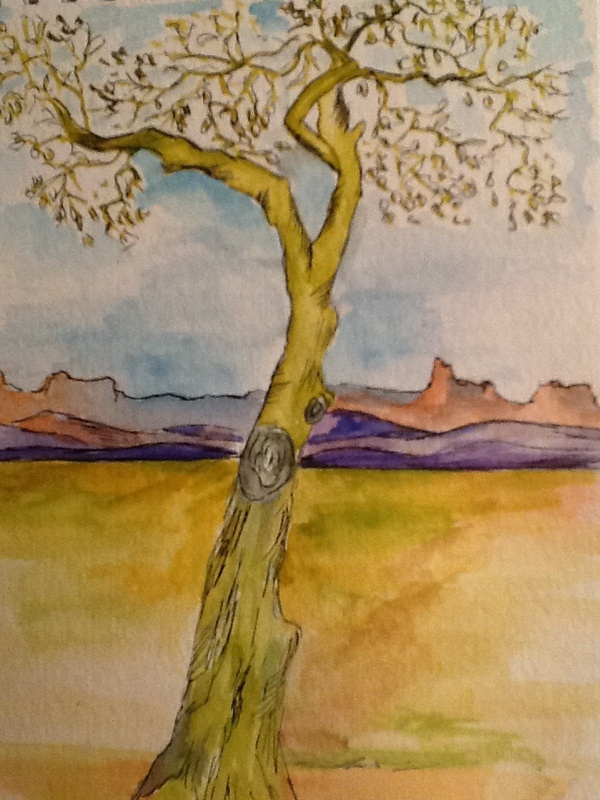 I was enthralled by one particular tree. My favorite color is green. The Palo Verde is a beautiful monochromatic green, standing out amongst the pale hues of the desert. 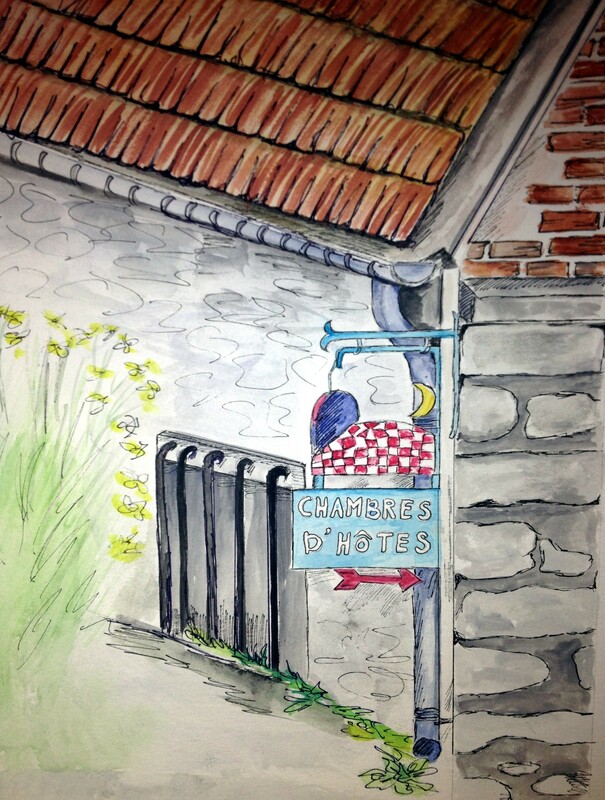 I made a quick pencil sketch, and tonight a small watercolor from my sketch. Don’t ask me why I didn’t take a moment to photograph the tree, but I intend to on our return trip. I’d love to do an oil painting of it. Early in this blog I had complained about the desert, later retracting my complaints because of some incredible photos I took. I really took the time today to study the colors and textures as we drove. Of course when you are driving by at eighty miles an hour things tend to blur, but when you really take the time to look the desert is rich in color. Like a perfect dance of soft hues blending one into the next. As the sun moves across the sky the mountains change from subtle color to rich brilliance, absolutely stunning. I announced the halfway point in my blog on Friday, had the wedding yesterday, so today is the official start of the second half of my year of dealing with my artistic procrastination. I went out today and purchased a few things to enhance my oil painting. (I know, the idea is to use up the supplies, not buy more), but I’ve decided that for this second half of this journey maybe its time to actually try reading and studying about the art I want to create. Flying by the seat of my pants has done pretty well by me thus far, but all those experts can’t be wrong. Its time to wave the flag of the surrender of my stubbornness. (A note to those close to me, the surrender applies to artistic endeavors only, sorry to burst your bubble.) I took the time this weekend to print out wallet sizes of most of the art I have produced in the last six months. The only comparison I can make is maternal. I obviously remember the birth of my children, I also remember much of their lives, but sometimes it seems as though I just turned my head for a second and they were grown. It’s similar to what I felt when I held those photos in my hand. It feels as though I just started this project. When I held that stack of photos in my hands I was surprised at the amount and scope of work I have produced, and dare I say it? I’m proud of myself for sticking with it, and pretty impressed with some of my work. I do have to admit that I wish there were more of the pieces that I really love, but maybe as I glance through those photos of the finished work I’ll inspire myself to do more. It might seem strange that I printed them all out when I have almost all of the originals here, but to print them all out in the same manageable size makes it easier for me to see what I have done so far. There is so much I didn’t think about or plan for as I headed into this, there have been some really frustrating days when it seemed as though nothing would work, but I’m feeling really good about this. For tonight I finished the sketch for watercolor that I started last night. 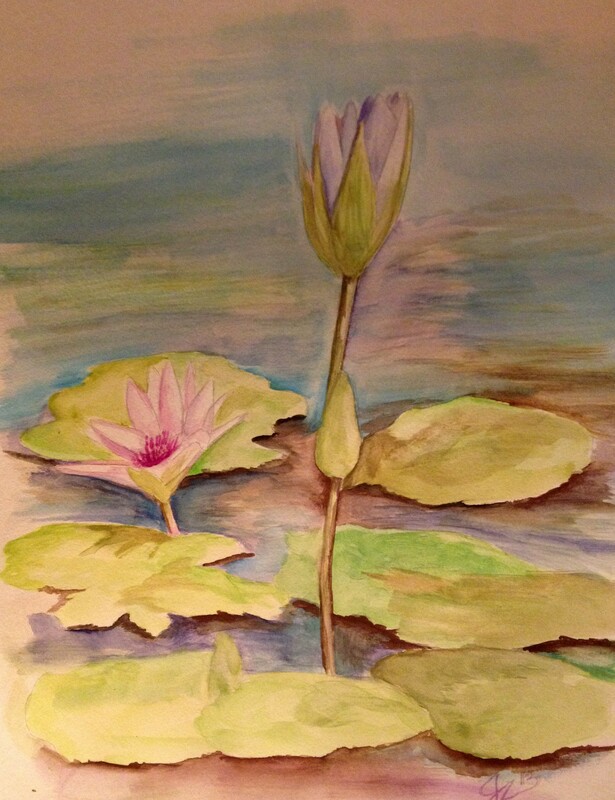 It is inspired by a photograph I took in Giverny. As I looked at the piece it a little like a children’s book illustration. I decided to go with that, and let the work lead me where it wanted. In the end I also added some fine line pen. I may just have to write a little story to go with it.